Since the modern Olympics began nearly 120 years ago, they have been dissected and evaluated through every possible angle. But data journalism is about looking at the world anew through the fresh lens of facts and numbers. With the Games in full swing, all eyes are on the medal table: who’s winning and which countries have the most gold medals? 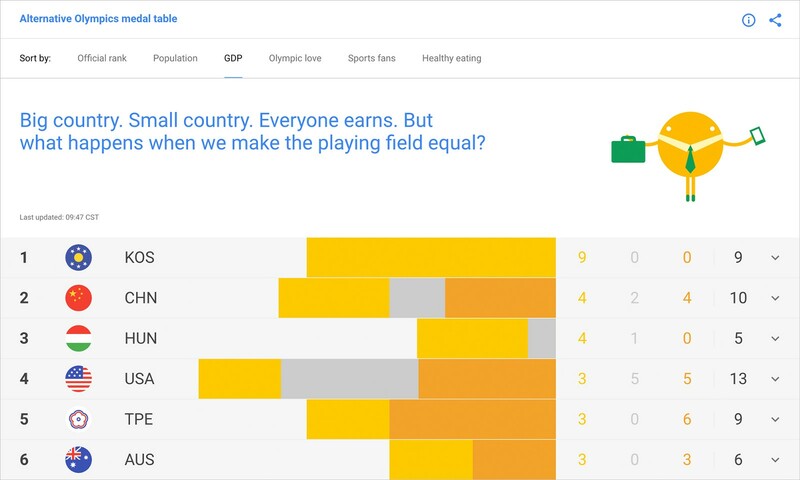 What if data journalism could give us a new way to see these staples of Olympic reporting? Every four years we see similar trends — the most populous countries and those that invest most heavily in their programs taking the top slots. But what if you could look at the medal table in another way? What if a small, less populous country, with fewer resources wins a large number of medals? How can we compensate for the size by using data? 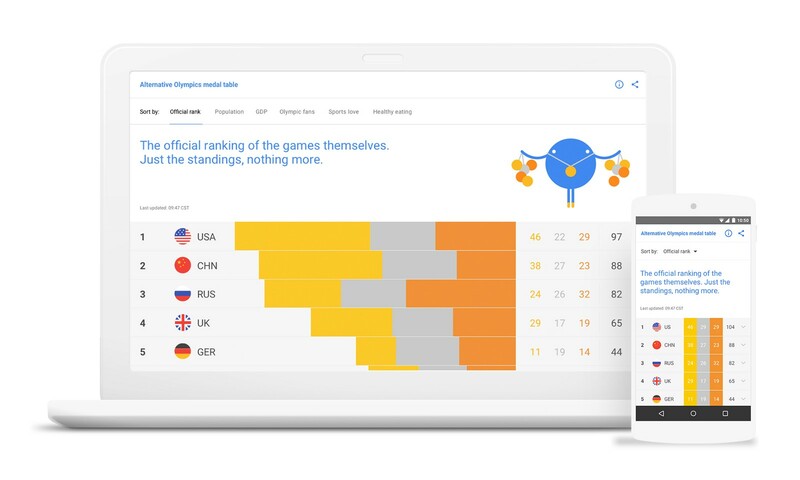 We wanted to apply the techniques of data journalism to this idea, which is how the Alternative Medal Table interactive was born. This experiment is based on an exercise I took part in for London’s 2012 games with statistician Christoforos Anagnostopoulos, then of London’s Imperial College. In 2012, we used data on population, GDP and team size to model what would happen if all the teams had equal resources. We wanted to show how small countries can really punch above their weight when it comes to being the best in sport. Why include Google Search interest in the analysis? Everyday I get to work with a dataset which provides a unique insight into the things we really care about around the world (and you can read more about this here). What if caring a lot about the Olympics — as represented in Search interest — was how we determined the winner? So Anagnostopoulos created this dataset, which allows us to weigh all the factors and create new ways to rank the countries. The big question is: why bother doing this? My answer is this: the sheer volume of data we have out in the world makes this worthwhile. If there is an opportunity to tell new stories around an event as familiar as the Olympics, then we should do it. The interactive itself was built and designed with Greg Calvert, Katherine Walker and Jacques Bruwer. The team has worked hard to create a visual that works well across mobile and desktop and shows complex data in a simple, clear way. It’s available in English, Portuguese for Brazil and Spanish and is embeddable on any website or blog (click the share button at the top right). Calvert says it’s all about making it simple but easy to understand. “The site has to display a lot of fairly complex information, so it was important to communicate what this thing is clearly and concisely, and get folks into the experience with as little learning curve as possible,” he explained. So, how does it work? Click on each of the factors at the top of the table to see the ranking reorder itself; click on a country to see how it ranks across all the variables. You can download the initial dataset here (which doesn’t have real medal data in) to create your own alternative medal index. We would love to find out if you do — email us at newslabtrends@google.com to let us know what you do with it. The exciting thing is, we have no idea what this data will show by the end of the games. Will the small Caribbean islands triumph in track and field when you take population into account? 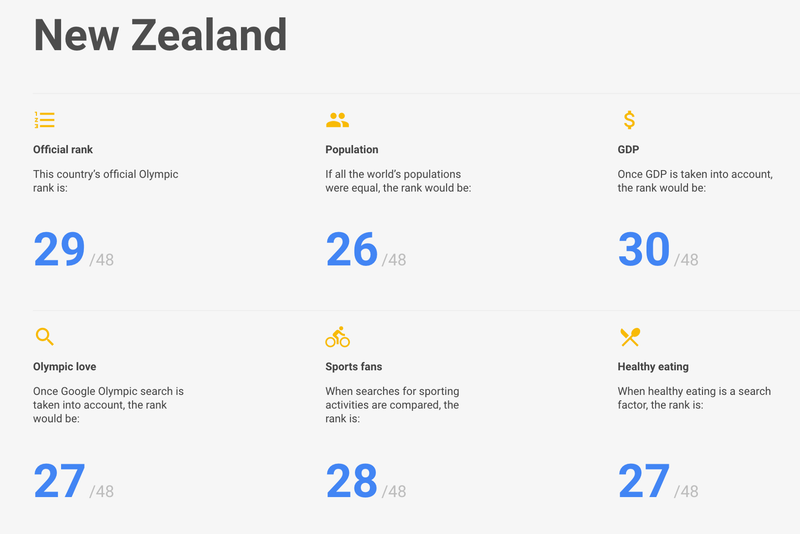 Will the countries with high Search interest also be those where the medals come rolling in? While we might not know the winners just yet, we’re just as excited as the millions watching around the world to find out.